@Joey: We don't know who is testifying until they take the oath. @S33 was she a foreign student? Who takes a 4 year old to a midnight batman movie? While survivors explain what they did prior to the movie, I'm thinking "meanwhile, JH is painstakingly preparing his booby trapped apartment". @Valm, so you stay away from all large crowds? Not the first person I have heard doing that post 9/11. Amanda Hernandez-Memije: "I collapsed myself to the couch.... started vomiting... had tremendous headache"
@Phil that would make a good poll question, Do you avoid large crowds, after this event. This Poll may be biased after the several other events including the Boston Bombing. Even though the govt. asks for you to continue your normal Practices. It's pretty rare that any given person would encounter such an event. I don't see any reason why it should affect my behavior. I think about this almost every time I go to the movies. Coloradoans, if I remember correctly several hospitals treated the victims free of charge, is that right? Question: Was mental help offered to the victims after the shooting? During this lunch I'm going to take a few minutes to post some video and text, I'll be away from this for a few minutes. @Valm, I for one do not do crowds period anymore. No concerts, sporting events etc. In todays day and age I consider any large group gathering, a possible target. I don't carry so I keep that into consideration. “We the people” should be proud of the justice system practiced in our country. As good or bad as one might believe it is, it truly is the best in the world. By the way, counting “objections”, “overruled”, etc. will not matter in the end. The decision lies with the jury. Defense attorneys also serve to remind the judge of the constitutional mandate and to meet the professional obligation to protect the rights of the defendant. Think of the defense attorney as a constitutional lawyer, defending our Bill or Rights. They protect and defend violations of the Fourth Amendment rights (unlawful searches and seizures), Fifth Amendment rights (coerced confessions), Sixth Amendment rights ( lawyer who is not totally effective in all respects), and Eighth Amendment rights (cruel and unusual punishment). My Mother was in a bank robbery when She was translating for the bank manager. You can be a victim of crime anywhere and anytime. I actually admire the defense team. Defense attorneys are an integral part of the US justice system within the rules of evidence and criminal procedure. I can't help but wonder why they decided to re-open the theater? After all the horror, why not just tear it down? OK half time stats..... 13 Objections 6 overrules @ 47% 7 Sustained @ 54 % It appears the DT has stepped up its game. @Phil, how many people are spectating in the actual courtroom? Is there still a lot of media presence outside? @Mandi - The theater still makes money. Remember, that place is where many people earn their income. It's a horrible thing that happened, but not a reason to destroy a business and put people out of work. They claim they re-opened the theater to try to keep things as normal as possible. They said by tearing it down it would have "allowed Holmes to win" in a way. 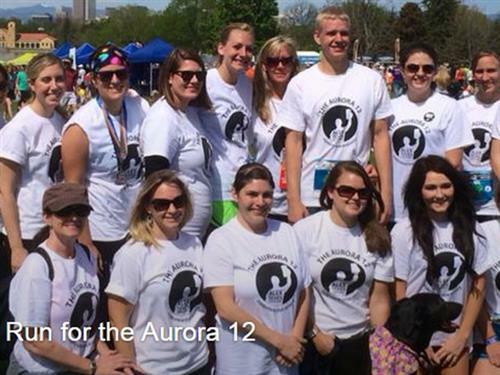 7NEWSAmanda Teves is hoping others will Run for the 12 to raise money for the charity set up in her fiancée's honor. Any indication of how many people are watching this trial in total? @jj1114: I do believe at least one hospital treated victims without charging them but I am not sure if all of them did. If I remember correctly it was Parker Adventist, which was much farther away and didn't take as many patients, a small handful at best. @Mandi, I think part of the reason they didn't tear down the theater is to show the strength of the community, that no matter what they can't be broken or torn apart. I am so afraid that once the psychiatrist that was seeing JH takes the stand a lot of finger pointing will be directed towards her.....that she could have prevented all of this by speaking up, putting him on a mental health hold and whatnot.... What are the chances that the DT turn the guilt onto her? Did they tear down Colombine? Did they stop holding the Boston Marathon? Did they tear down Sandy Hook? How about the McDonalds in San Ysidro? How about Ft. Hood. Really? people get a grip, it is a simple building. It had nothing to do with what happened. I know I'm late (in regards to the poll), but I wanna put my 2 cents in anyways. I lost someone I loved in the theater shooting, and for a while after it happened I refused to go anywhere that would consist of more than 20 people (aside from work, of course). However, as time has gone on, I'm getting over that slight fear and while I'm constantly looking over my shoulder, I'm not as scared to go to crowded events. Still won't go to that theater though. @proph, I'm sorry for your loss. :( I'm glad you have been able to start getting over that fear.